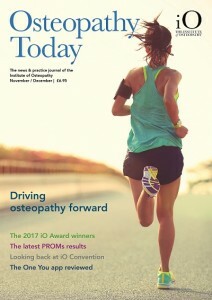 Osteopathy Today magazine (OT) is the professional journal of the Institute of Osteopathy. Positioned as our news and current affairs periodical, OT also offers the profession a safe environment to discuss and debate important issues in a respectful and professional manner. 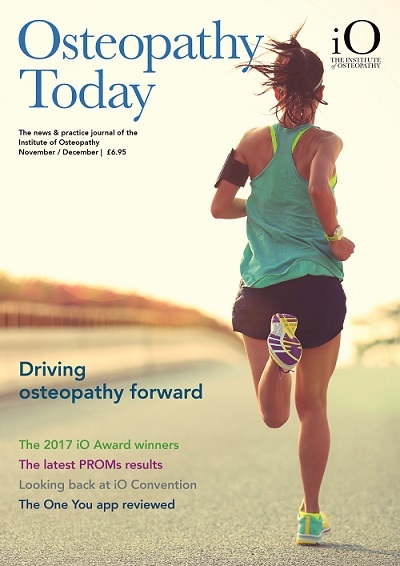 The magazine also communicates events and developments within the profession, and offers high quality CPD and promotional opportunities for osteopaths. It is seen to be a key member benefit by 84% of members (iO Census 2014). All articles should be worded in a way that is respectful to the views and opinions of others and be in keeping with the ethos of a professional journal. Submissions will be considered by the editorial team for inclusion and the editorial team reserve the right to request revisions from the author prior to publication. Submission for consideration does not automatically guarantee publication, and the article may not be included if deemed unsuitable or inappropriate for the professional journal. Articles may be held back for the most appropriate issue of the journal and might not be published in the next edition unless time sensitive. Purpose – To enable members, or non-members on request from the iO team, to raise issues for discussion and debate. Criteria – Opinion pieces will be clearly identified as such at the start of the article. Articles should include a clear introduction to the subject in the first paragraph and a concise conclusion at the end. The main body of the text will allow the author to develop their case. All statements of fact (e.g. “It is well known that…”) must be justified and referenced. If you are unable to reference, these must be stated in language that indicated this is the authors opinion (e.g. “It may be suggested that….”). They should not be used to advertise or promote any product or services, covertly or otherwise. Recommended word count – Maximum 750 words with images (1000 words without). This will provide approximately a one page article in the magazine. Purpose – A researched, evidence based CPD article. These articles should provide evidence supported information which osteopaths can apply to practice and/or direct osteopaths to further self-directed learning. Authors should include 10 multiple choice questions at the end that will allow readers to test their understanding of the subject matter after reading. The proposed learning outcomes should be identified in the opening paragraphs and should also be mapped against the Osteopathic Practice Standards. Initial training Institute and year of qualification, overview of clinical practice/experience and post-graduate training, current practice, other roles in the osteopathic profession (e.g lecturing, committee members, etc). Authors are also requested to provide a high resolution ‘head shot’ photograph. Purpose – To notify the profession of the death of a member of the profession. Criteria – The title of the piece will be the full name of the deceased followed by the relevant dates of birth and passing. The person’s main academic achievements and contribution to the profession should follow as appropriate. The Editorial team will include a maximum of one obituary per issue of the journal. One high resolution professional photograph of the deceased may also be included. Purpose – To allow not-for-profit osteopathic communities of practice to make the profession aware of upcoming events. If appropriate, these will also be included on our on-line calendar and e-newsletter for free by reciprocal arrangement. Criteria – This article should include the date, venue and topic of the event, a brief indication of the purpose of the event and in the case of CPD, the proposed learning outcomes. They should also include contact phone and email addresses for further information. General publication rules apply. One high resolution image (i.e. logo or photograph of previous events) may be included. CASE STUDIES – We are keen to have examples/case studies of how successful community and clinical interest groups have developed and would welcome contributions from those involved to demonstrate best practice and the benefits to osteopaths of becoming involved and/or creating such communities. Purpose – An advertisement presented as an article, used to promote a specific product or service. Please note, advertising terms, conditions and charges apply. Criteria – Advertorials will be clearly identified as such at the start of the article. All statements of fact (e.g. “It is well known that…”) must be justified and referenced. If you are unable to reference, these must be stated in language that indicates that this is the authors opinion (e.g. “It may be suggested that….”). All advertorials will still be subject to general guidance on appropriateness for inclusion in the professional journal.